This time our cow gave birth in just the nick of time. We had a bad storm the day before and we were expecting tornadic weather the next night. She gave birth between the bad weather and in just enough time to get everyone safely to the barn before the down pour and the wind blew in. This hardly ever happens in farm life. You can usually count on the sheep to give birth when it is 7 degrees outside and expect to be chasing pigs down the road when your late for an appointment. This time… it was perfect timing. We were so grateful. Right before the storm set in, the misty rain started softly. My husband coaxed me to the barn so he could show me how cute the new calf was. We ventured out to the barn on a dark, non-direct path tripping over rocks and the electric fence to take one last peak at the new Guernsey calf right before we settled in for the night. 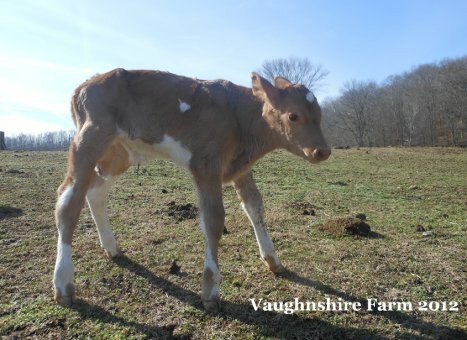 The calf had quite the long legs and had been having a time getting use to his “stilts” as my husband called them. We wanted to make sure he getting up and nursing and that Dixie was aware to take precaution with the unstable newborn. All was well. The wind picked up. The misty rain fell a bit more moody. We stood there admiring the attentive momma cow and her new calf-ling. A feeling of overwhelming blessing swelled up inside me. Being thankful for a calf born on your farm may not seem like much, but to us, it was a positive, happy moment that we needed after a long period of drought and struggle. It represented a milestone in our farming adventures as we raised both the momma cow and the daddy cow. It represented a multi-animal-generation now living on our farm as we originally started with this calf’s grandmother as our milk cow. It also represented the provision of meat for next year. And most exciting, this new life represented the fact that our bull actually works. I couldn’t help but think… for thousands of years people have been venturing out to their barns or fields to admire new life on the farm, just like we were doing. I wondered if Abraham and Sarah ever stood and marvelled at their newborn calf-lings. I’m sure they did. Admiring new life is a common theme people of all ages and times have experienced. That night, I felt a bit more connected to the past as I thought of previous generations who also stood in awe and wonder at the sights and sounds of new life on the farm. ← Training A Milk Cow?